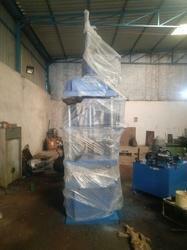 Perfect Engineers a leading manufacturer and supplier of hydraulic machines and hydraulic power press. We have been offering high durable and excellent performing collection with easy to install operations. Compact designs and high portability of the range ensures easy transportation of the range from one place to another. In addition to this, we also provide the range with robust construction and precision engineered designs with temperature as well as heat resistance features. Our low maintenance and power saving range is available at the best prices. Usage for utensils , sink , pressure cooker , bowls etc. Application For Deep Drawing on SS Sheets , CR sheets etc. Deep drawing is one of the most popular metal forming methods available to manufacturers- it involves the use of metal dies to form blank sheets of metal into a desired shape. Deep drawing is especially beneficial when producing high volumes, since unit cost decreases considerably as unit count increases: once the tooling and dies have been created, the process can continue with very little downtime or upkeep. Tool construction costs are lower in comparison to similar manufacturing processes, such as progressive die stamping, even in smaller volumes; in these situations deep drawing may also prove the most cost-effective manufacturing solution. The deep draw process can be used for a variety of applications across a range of manufacturing industries, each offering our customers many benefits over other fabrication methods. The deep draw process holds out cost savings in less material consumption, reduced fabrication costs to arrive at a finished part, and less dimensional variability. Deep Draw PressWe offer heavy duty frame type deep draw press, hydraulic deep drawing presses, which are widely used in different industries to manufacture deep drawing components. 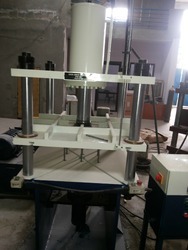 These are heavy duty, high performance, pillar type hydraulic press for manufacturing deep drawing press components. Impeccably equipped with most advanced hydraulic & electronic (PLC) control. They are designed for high off center loads with heavy RAM force. Accurate slide guiding with full stroke length is helpful to provide the better accuracy & effective performance of the presses. Deep draw press is perfect for deep drawing automobile sheet metal components, oil tanks, stainless steel kitchen sinks, mudguards etc.